Anti-Syrian politicians in Lebanon have accused Damascus of being behind a car bomb in Beirut that killed Lebanon’s head of internal intelligence. Opposition leader Saad Hariri and Druze leader Walid Jumblatt say Syria’s Bashar al-Assad was behind the blast. A Syrian minister has condemned it. Mr Hariri’s coalition called on the government to resign, ahead of an emergency cabinet meeting on Saturday. Hariri supporters have held tyre-burning protests against the attack. 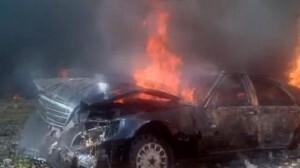 They have set up roadblocks around Lebanon’s capital, while denouncing the Syrian president and his Lebanese allies. Friday’s blast left eight people dead and wounded dozens. It occurred in the mainly Christian district of Ashrafiya, in a busy street close to the headquarters of Saad Hariri’s 14 March coalition. Internal intelligence head Wissam al-Hassan was among those who died. He was close to Mr Hariri, a leading critic of the government in neighbouring Syria. Mr Hassan led an investigation that implicated Damascus in the 2005 bombing that killed Mr Hariri’s father, former Prime Minister Rafik Hariri. He also recently organised the arrest of a former minister accused of planning a Syrian-sponsored bombing campaign in Lebanon. “We accuse Bashar al-Assad of the assassination of Wissam al-Hassam, the guarantor of the security of the Lebanese,” Mr Hariri said on Lebanese TV. Mr Jumblatt told satellite channel Al-Arabiya: “[Bashar al-Assad] is telling us that even though he turned Syria into rubble, `I am ready to kill in any place”‘. Nadim Gemayel, an MP from the right-wing Christian Phalange Party, also pointed to Syria, where an uprising against Mr Assad that began 18 months ago has led to an increasingly violent conflict. “This regime, which is crumbling, is trying to export its conflict to Lebanon,” he said. Mr Hariri’s 14 March bloc issued a statement accusing the Beirut government of protecting “criminals” and calling on it to stand down. 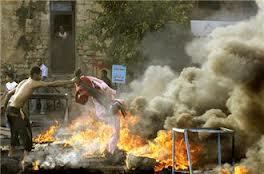 Anti-Syrian protesters burned tires during demonstrations in Beirut and Tripoli late on Friday. The force of Friday’s blast, the worst in the Lebanese capital for four years, ripped balconies from the fronts of buildings and set many cars on fire. For many, it evoked scenes from Lebanon’s civil war in the late 1970s and 1980s. Lebanese Prime Minister Najib Mikati said the government was trying to identify the perpetrators and they would be punished. Lebanon’s Shia militant group Hezbollah – a close ally of the Syrian government – condemned the bombing. Syrian Information Minister Omran al-Zoubi called it a “cowardly, terrorist act”. He said such incidents were “unjustifiable wherever they occur”. UN Secretary General Ban Ki-moon called on “all Lebanese parties not to be provoked by this heinous terrorist act”, while EU foreign policy chief Catherine Ashton called on “all Lebanese to remain calm”. “Lebanon must close the chapter of its past and bring an end to impunity for political assassinations and other politically motivated violence,” she said. Brig Gen Wissam al-Hassan was viewed as one of the leading Sunni figures in Lebanon. As head of the intelligence branch of the Internal Security Forces (ISF) he did not have a political role, but was still a key player in the opposition 14 March bloc. Born to a Sunni family in the northern Lebanese city of Tripoli in 1965, he spent the early part of his career looking after the security of Sunni leader and former Prime Minister Rafik Hariri. He rose up through the ranks to become head of the prime minister’s guard detachment in 2001. A few years after Hariri’s death in a massive car bomb in 2005, there were reports that Mr Hassan was suspected of involvement. As Mr Hariri’s chief of protocol, he would normally have been in the convoy that was hit by the blast but had taken the day off to take a university exam. UN investigators were reported in 2010 to have found this alibi unlikely, but Mr Hariri’s son Saad said he had always had full confidence in Mr Hassan. The following year, Mr Hassan was not among those indicted by the UN-backed tribunal. Instead, prosecutors sought the arrest of four members of the pro-Syrian Shia Islamist movement, Hezbollah. Elias Muhanna, a professor at Brown University in the US and editor of the Qifa Nabki blog on Lebanese politics, said the allegations were a “strange, unexplained aspect” of Mr Hassan’s past, but had not dented his standing in the Sunni community. He said the brigader-general was a high-profile figure, someone seen as a “protector of Sunni interests and an integral part of 14 March”. 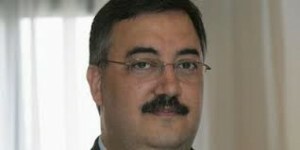 Mr Hassan’s branch of the ISF was perceived as being strongly anti-Syrian, in line with 14 March’s politics. In 2005, he led an investigation into the death of Mr Hariri which implicated the Syrians, who at that time still had a military presence in Lebanon. He had been in the news again recently following the arrest of pro-Syrian politician and former Information Minister Michel Samaha. The Christian ex-minister was detained at his summer residence in August, accused of having explosives and making plans to target Sunni leaders supporting the opposition in Syria. Following Wissam al-Hassan’s death in a car bomb in Beirut’s Ashrafiya district on 19 October, Saad Hariri and a number of other Lebanese political leaders directly accused the Syrians of being behind the attack. My I suggest a triple espresso and rethinking israel being the only beneficiary, while you are right motive is the heart of any investigation israel does not need to lift a finger to make headlines that we are commenting about, just read the simple justification and joy anti fsa has in above comment that if you oppose assad you deserve this outcome. how I wish israel can be totally eliminated TODAY just so i can prove to every arab that as bad as israel may be the majority of arabs are a million times worse, self rightous never see their wrong and allways serve the intrest of anyone above and beyond their fellow citizen., jews deserve an award for their unity and outreach to one another, if the lebanese were half as united and as commited to their own it would have a real chance, lets be honest about it is NOT ok to be desensitized to the horrible images of this event or any other in any country against anyone.